Enjoy Life Foods has a purpose. That is, making good foods that keep people's insides happy,too,and our family are all now big fans of theirs. Both Gerry and I suffer from food intolerances and troubles with digesting certain foods, for one reason or another.Now we don't believe we have actual food allergies but there are some things we eat that our tummies just don't like.So many of our foods have so many unknown ingrediants to us though, that is it any wonder?Their products are gluten free and made without 8 of the most common allergens- plus they taste great! We've almost gone through all of samples-especially their double chocolate chip and double chocolate crunch cookies.They do however carry a complete line of not only cookies though, but baking products, cereals, and so much more.I can't wait to try more of their products. I came across Enjoy Life Foods after looking for a more healthier cookie to eat, and so glad I found Enjoy Like Foods. They can be found at local retailers or you can shop directly online for them. A big thank you to Enjoy Life Foods for giving us this opportunity to review a superb product that we are happy to tell our readers about. Enjoy Life Foods would love to give away to one of our lucky Canadian or US winners, 2 boxes of your favorite flavour of their Crunchy Cookies. A random draw will be made on July 27, 2011 from all entries recieved, through Random.org. Please tell me if you have tried Enjoy Life Foods before. No I have never tried them or heard of them! I don't think I've ever tried it, but I would love to give it a try! I have not heard of Enjoy Life Foods before, but I wish I had, they sound wonderful. I really want to try the Crunchy Double Chocolate Cookies and the Crunchy Chocolate Chip cookies. Yumm. I have never tried Enjoy Foods before. I follow Enjoy Foods on Twitter. I don't believe I have tried these before. Can't say I've tried them but they sound fantastic. I'm always looking for a better cookie option daughter. I am subscribed to your emails (ecollins86@hotmail.com). No, I havent tried Enjoy Life Foods before. I have not tried Enjoy Life Foods before. I have not tried their products before but I'd like to. One has to love a company who posts the ingredients of their products online for all to see. I've a couple of different products by Enjoy Life Foods before, but never the crunchy cookies which look great! I have never heard of this company before. No I have not tried it ! hope to win ! I have not tried them, hope to win ! 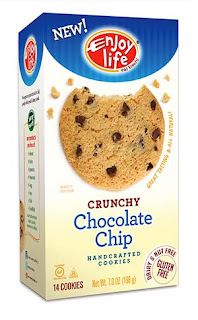 I have tried Enjoy Life Mega Chunks for baking before and really liked them. I follow Enjoy Life on Twitter. I have tried and loved their cookies! I've never tried Enjoy Life Foods before! I have never tried them before but I would love for this to be the first time! I have never tried Enjoy Life Foods before. Have not tried this before. Unfortunately, I have not tried any of their products. Love to though, hoping to win. I haven't! but I'd love to! I've never tried them before but would love to. My son is on a gluten free diet so these are perfect. I like Enjoy Life Foods on facebook -- Jen Tam.